For advertisers it’s not the taking part that counts, its the winning. Ah, the Winter Olympics, an occasion when millions of people whose closest association with ice normally comes from a scotch on the rocks, become experts on the more arcane aspects of curling, ice dance and the luge. I find myself shouting at the screen condemning the GB snowboarders for the failings on the half pipe or at the speed skaters for the inability to stay on two feet whilst going flat out round corners on a near frictionless surface whilst being jostled by their rivals. Then I stop to think about how ridiculous it is for me to even begin to criticise a group of dedicated athletes who have been practising their craft day in day out for years and years. I have no idea what training they’ve done, what competitions they’ve entered, what strategies they are following, what financial backing they have, whether their equipment is good or bad or how the conditions on the day will affect them. But like all good armchair spectators watching all good sport there is one thing that is normally pretty obvious. So, what am I getting at? Well, I’m thinking about our business… the business of creating advertising that gets results. For the consumer out there all the matters is that the advertising ‘wins’. That it reaches them when it counts and wins their business and, when it comes to brands, their hearts too. The consumer doesn’t give a damn about us lot sitting in the office, or the pub, coming up with concepts. They don’t care about our training, our dedication our talent or our hard work. They care about what they see on that billboard, on the TV, on social media, in the press. They don’t care about the rules, about data counts or about marketing strategy. They are watching the advertising Olympics every day, and like the Olympics it all boils down to results. Of course, we can all praise participants for their grit, their determination, and their style, but the truth is that it’s gold that counts, and if there wasn’t a competition with winners and losers, there wouldn’t be an Olympics. It’s not up to the consumers to think about those things. The consumer is the judge sitting beside the ice rink giving the score for that Triple Axel or Lutz. It is up to the client to give it some thought though… for them things like experience, talent, equipment, dedication and strategy are vital and will make all the difference when it comes to getting results. But ultimately for them too, it’s the results that count and if an agency can’t get them, they’ll be dropped from the squad. Anyway, back to the speed skating, I feel another burst of loud shouting coming on. 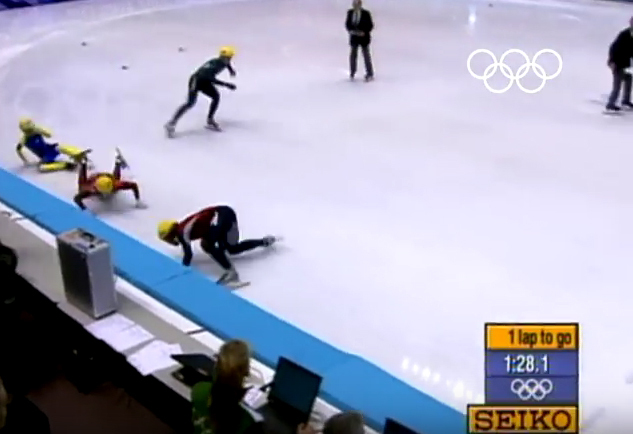 And by the way, sometimes you just have to get damn lucky to get a result… like Aussie skater Steven Bradbury at the Salt Lake winter Olympics in 2002. Making a virtue of being virtual Snow Problem!